"For over 35 years, I have relied on the natural products offered by the illustrious Penn Herb Company Ltd. I first learned about this family-run business in the 1970's from my grandmother, Fritzie, who taught me how to take care of my body from head to toe, inside and out, using only natural remedies. Whether you're in the need of wildcrafted herbs in tea, powder, or capsule form, or you need some advice on what to use for an ailment or health issue, you can simply go to their catalog, website or newsletter and find out the best, natural remedies and learn how to live a more natural lifestyle. In my books, radio and TV interviews, and workshops and health retreats worldwide, I am always extolling the virtues of this esteemed company and their complete product line. Because of all their natural products, I have never taken medication in my life. My natural medicine cabinet is filled with products from Penn Herb Company." 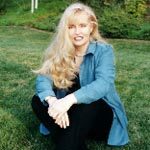 Susan Smith Jones, PhD: Author of over 27 books, including her latest best-sell ers Walking on Air: Your 30-Day Inside And Out Rejuvenation Makeover, The Joy Factor: 10 Sacred Practices for Radiant Health, Recipes for Health Bliss, The Healing Power of NatureFoods, Health Bliss, and Be Healthy~Stay Balanced. You may purchase any of Susan's books by clicking HERE. 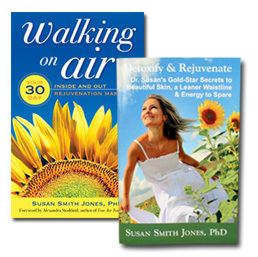 SPECIAL OFFER #1: Get the booklet "Detoxify & Rejuvenate: Dr. Susan's Gold-Star Secrets to Rid the Body of Toxins & Glow AND a BONUS CD FREE ($14.95 Value) when you order "Walking On Air". SPECIAL OFFER #2: Get the booklet "Weight Loss: Make It Easy With Herbs" AND a BONUS CD FREE ($14.95 Value) when you order "The Joy Factor". SPECIAL OFFER #3: Get the booklet "Culinary Herbs - Discover The Healing Secrets in Your Spice Rack" AND a BONUS CD FREE ($14.95 Value) when you order " Recipes for Health Bliss". SPECIAL OFFER #4: Get the booklet "Detoxify & Rejuvenate: Dr. Susan's Gold-Star Secrets to Rid the Body of Toxins & Glow with Vibrant Health" when you order "The Joy Factor". 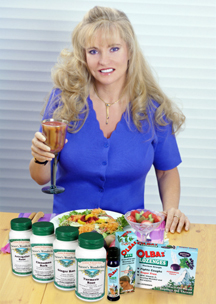 Susan has been an enthusiastic consumer of Olbas Remedies for decades and recommends all of them in her new book The Joy Factor. Watch the Olbas Movie! 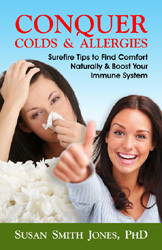 "You’ll want to get copies of each of my new booklets on natural remedies featured in these pages below. Through each booklet, you will learn more about how to create radiant health, and the many herbs I recommend for whatever ails you as well as the ones that I take everyday to stay healthy, keep my body in tip-top shape and celebrate life. These booklets make wonderful gifts of health to give to your family and friends for any occasion." Click HERE to listen to Dr. Susan discuss her favorite natural Remedies. The first radio program is entitled "Nature's Medicine Chest". 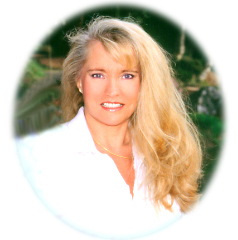 The program features Susan Smith Jones, PhD, world renowned author & health consultant. In this program, Dr. Susan discusses her favorite natural remedies and tips for using them. Hosted by Nick Lawrence. There are also other shows on the list you will enjoy. You may continue browsing or shopping while listening to the program. You'll enjoy this 6-minute radio talk show interview excerpt, Health By Choice, Not Chance, with Susan Smith Jones, PhD. With enthusiasm and aplomb, she discusses some of her favorite natural remedies you will want to know about, and provides many tips on how to live a healthy, balanced life. After you finish watching this video, please click here to find out how to get copies of her 3 news herbal, natural remedy books that are featured in this video.